Commentary on The Art of Agile Development's Real Customer Involvement practice. 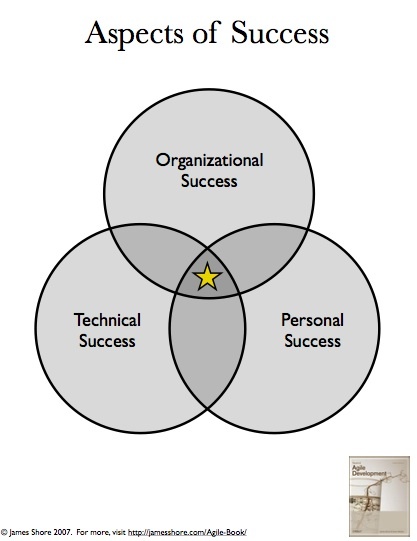 I like to say that successful software requires three components: organizational success, technical success, and personal success. Organizational success because we need to turn a profit, or realize some other sort of value. Technical success because we don't want to throw away the software and rewrite it every few years. When Shane and I were first writing The Art of Agile Development , I thought of personal success from the perspective of the development team. "Without personal success, you'll have trouble motivating yourself and employees," we wrote. And that's true. In thinking about it further, though, I've come to realize that personal success is much more important than that. Much as we might like to believe otherwise, we humans are fairly irrational creatures. We tend to make decisions for emotional reasons rather than logical reasons. That's where personal success comes in. You might be building the best thing in the world, but if your project doesn't make the person thinking about it feel good--if it doesn't contribute to her personal success in some way--she's not gonna love it. And if she doesn't love it, she's not likely to push it. And if nobody else important pushes it either... goodbye, project. The end. Jerry was furious [about his project being cancelled]. After investing so much time and energy in the project, he was intellectually convinced of its importance and he was emotionally committed to it. Could the company be this stupid, he wondered? Do I really want to work for a company that is this stupid? At 4:45 p.m. Jerry resigned and went home. His boss called him two or three times the next day, but Jerry refused to take the calls. It took him a week to get over his rage. It took another six weeks to get a new job. Shortly after Jerry started his new job, he received a call from an old friend still working for his previous employer. Jerry's friend related a story that was circulating among some of the people there. The story went like this: An executive in the Sales Department learned of Jerry's project about three weeks before the project was terminated. According to the story, he instantly disliked the idea, basically because selling the equipment would require a knowledge of hospitals and medical-purchasing practices that his sales force did not have. So, according to the story, he got one of his people to fabricate some very pessimistic numbers about market potential. He sent these numbers to a marketing executive, who was also a good friend, along with a note asking, "Why are we wasting research on this project?" True North pgs., "Mastering Projects Workshop." Adapted from John Kotter's Power and Influence , 1987. Personal success. It's so damned personal. So. Keep personal success in mind. Not only do you need the support of important stakeholders, you also need to avoid sabotage. How? Talk to people. Find out what their interests are. Watch for little reactions when you describe various features. Ask if your needs make their lives difficult. Offer to help ease their pain. Give them a chance to be a part of your success.